The Socialist Party spoke for many disaffected groups in the early 1900s, especially Jewish immigrants. Its leader was Eugene V. Debs, a colorful labor organizer who ran for U.S. president five times. 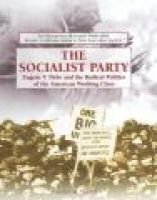 The story of the party's impact on American politics during that time is explored as well as profiles of famous Socialists such as muckraking journalist Upton Sinclair, author Jack London, and attorney Clarence Darrow.